Sling TV is a streaming video television service that gives you 31+ channels for just $19.95 a month. You can use it to stream to your smart television or any other streaming device you use. If you don’t have a smart TV or streaming device Sling has that too! 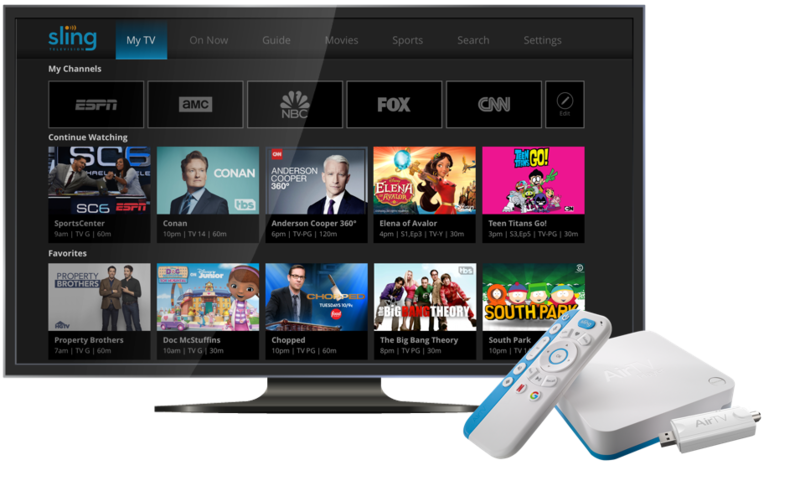 Introducing the Sling AirTV Streaming device…. Cable TV over the internet at a fraction of the cost. No contract, no activation fee, and a 7-day free trial to see if it’s for you. Or call us at 630-204-9797 and we can sign you up by phone. It’s that simple! Best of all there are No contracts, Cancel at any time, Easy online cancellation. Q: Is Sling TV available in Chicago? Yes it is available to people who live in the Chicago metro area. Q: How is it different from my cable or satellite provider? To use it you’ll need a good internet connection and a compatible device to run the Sling TV app, which takes the place of a cable or satellite box and connects to a TV. You can also watch on your phone, tablet or computer, either at home or away. Q: Can you stream movies? Yes you can stream movies with NETFLIX, Google Play, Vudu, Hula Crackle, and even Kodi. All you have to do is download their apps. NETFIX and Google Play are already downloaded for you. Yes we will set it up for you. In fact we will sign you up with Sling and get you the $50.00 programing credit which is 2 1/2 months free. Best of all no contract required. Q: Can I get sports channels? Yes Sling TV comes with ESPN 1, ESPN 2, ESPN 3 and FOX North. You also can add additional sport channels. Q: What does Sling TV cost and what does it include? It’s considerable cheaper. They have two packages $19.95 or $25.00 a month. Plus you can add channels like HBO. The most Economical Package is called the “Sling Orange Package”. It is only $19.95 per month. Compare that to your existing cable or satellite bill. Why pay morel. Another base package is called “Sling Blue” which costs $25 per month. Each offers slightly different channel lineups. You can get all of the channels in both packages and add movie channels like HBO, STARZ and Cinemax. Unlike cable or satellite, there are no contracts and you can cancel or resume service anytime, with no penalties. One way to think of it is Netflix, but with live TV. New…….FOX Sports North. Now watch the Twins, Wild and Timberwolves live. Sling also has its own voice controlled streaming device that combines Sling TV, NETFLIX and Google Apps to stream movies, with over-the-air TV. It even has a combined programing guide for both Sling TV and antenna TV. All you need is an over-the-air antenna to receive all the local network and HD channels in your area. Just add the "Sling TV AirTV" streaming device. Stream Sling TV Stream NETFLIX Stream HULU and VUDU Download any Google app and stream No smart TV or a streaming device?............No Problem! Mr Free HDTV Man is an authorized retailer of DISH Network L.L.C. DISH, DISH Network and DISH Network logos are trademarks, registered trademarks and/or service marks of DISH Network L.L.C. and its affiliates. The DISH Network trademarks, registered trademarks and/or service marks are used under license of DISH Network L.L.C. and/or its affiliate Sling TV. Click here to see our reviews. Angie's list is now free for homeowners. Click to see our BBB reviews. No membership required.